The air conditioning repair costs can vary depending on several aspects. The first one is the age of the device. The older it is, the less likely it will be possible to find spare parts for it. But, at the same time, it will be more than likely to find easy solutions to their problems as old machines are more simple gadgets; with just some single adjustments to have them again operational. Therefore, we have more cases to be considered, which will be listed below. For newer units, air conditioning repair costs can be cheaper because it may still be under warranty. If it is, then you may only have to pay for the labor, depending on the warranty, and how close it is to expiring. On the other hand, while there may be less moving parts, there are more electronic devices, and usually replacing them is more costly, and in some cases, the technician may have to wait for the part to be shipped. 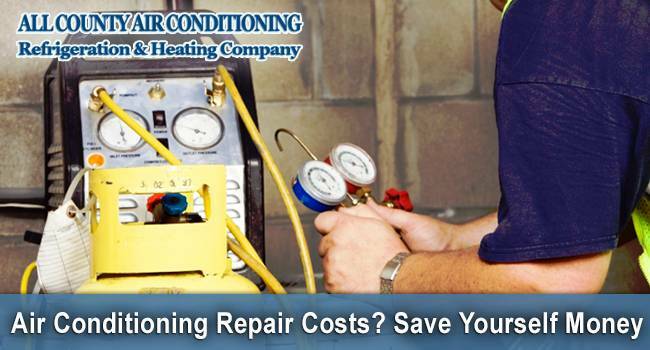 These air conditioning repair costs also depend on the person or company hired to do the job. In many cases, hiring the company that is linked to the air conditioner may be more expensive than hiring an independent professional. It is also a wise idea to check with the warranty, because they may require a certain agent to come and fix the problem, otherwise it may void the warranty. If this isn’t a problem, it is a good idea to check around for the best prices before you just hire the first repair man you find in the phone book. Ask about how long they have been working on air conditioners, and if they have any special training in the kind of unit you have. Typical air conditioning repair costs can vary from a few hundred dollars, to well into the thousands, depending on what has to be done, and the type of air conditioning unit you have. The more complicated the system, the more costs that are going to incur. One of the things you should think about before repairing your unit is whether or not it may be a better idea to just replace the unit with a brand new more efficient model. If you are constantly having trouble with your unit, it may be time to replace the whole thing. With all the tax credits that are available to help you get a newer, more efficient unit, now might be the time to do this. There are other ways to cut down these costs as well. When you buy an air conditioning unit, no matter how long the included warranty may be, if there is an option offered for an extended warranty, you should purchase it. Even if the cost may seem high at the time, extended warranty coverage can save you thousands of dollars in repairs over the long run. Another way to save is by getting home appliance insurance, which covers not only air conditioning repair costs, but all of your other major household appliances as well.